It may be a cynic who knows the price of everything, and the value of nothing, but politicians often seem to fit Oscar Wilde’s description rather better. Take the current proposal to ‘modernise’ the Greek economy by permitting the adulteration of one of the country’s great contributions to our food, the extra virgin olive oil produced with care, skill and not a little love by small producers across the country. The idea, if you can call it that, is that by blending the olive oil with cheaper vegetable oils, manufacturers will be able to produce in greater bulk and penetrate new export markets, including the all-important China. The only sop to the agricultural co-operatives and the single estate producers is that the blends would have to be clearly labelled as such. The irony of Greeks having to ruin perfectly good olive oil in the quest to sell to a supposedly communist nation that makes its money by undermining the industries of the ‘free’ world with cheap plastic knock-offs should be obvious. The proposal ranks with the ruination of the British loaf through the Chorleywood bread process or the threats to ‘improve’ competition by removing the purity laws that govern the production of German beer. Apparently it’s all the result of an efficiency study commissioned by the Greek government from the Organisation of Economic Cooperation and Development, or OECD, in Paris. It delivered 328 pages recommending changes to regulations for commonly used products. One politician is quoted by the Associated Press on Ekathimerini.com as calling it ‘a cause of war’. As if Greece needed another set of bright ideas imposed from outside the country. I noted last summer that craft beers are beginning to make inroads into Greece. In the UK, they’ve rescued many a pub that the big ‘hospitality’ chains can’t sustain now they’ve been divorced from the brewing of their primary product – beer. Perhaps the Greeks would be better advised by a delegation of Shoreditch’s finest from London’s micro-breweries than a bunch of economists trained at the École Nationale d’Administration. Among the best of the Greek olive oils are those pressed from the koroneiki olives grown in and around the Mani peninsula in the southern Peloponnese. These are not the big, tasty purple Kalamata olives you buy to eat, but they are just as vital a crop for the local growers. You can find these oils in UK supermarkets if you are prepared to look beyond the ranks of Spanish or Italian blends (the latter often including Greek oil bought in bulk and shipped across to give some flavour to the Italian stuff). It’s well worth the effort. 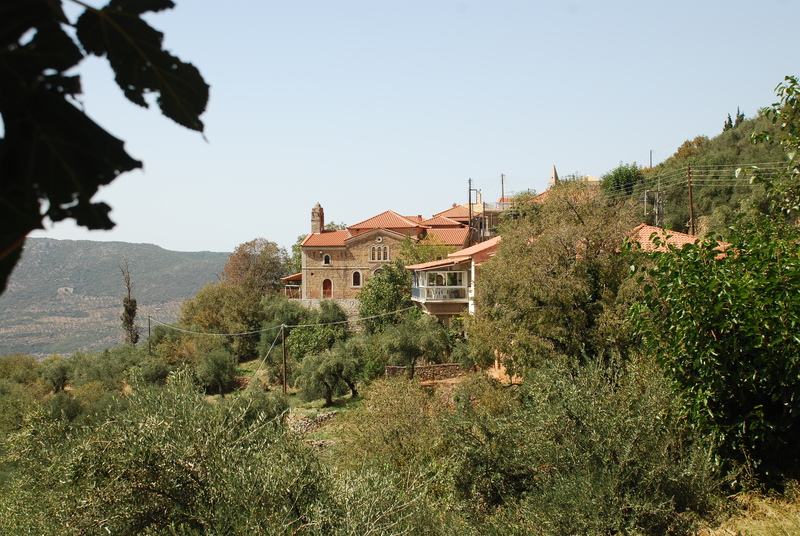 Better still you should travel to the Mani, see the olive trees in the foothills of the Taygetos mountain range and taste the oil in the local cooking. Though beware, some tavernas are shipping in sunflower oil in the alleged interests of healthy eating. I suspect that was another diktat from Athens. This entry was posted in Greece and tagged Economy, exports, Greece, Mani, olive oil, Peloponnese, travel on February 24, 2014 by paulnettleton.